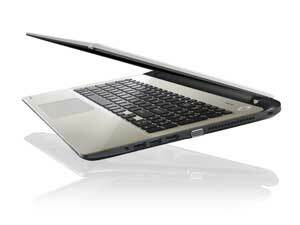 Toshiba Satellite L50-B-1UU 15.6" Quad Core Laptop Pentium N3540 8GB RAM 1TB HDD. Note : Picture are only for illustration purposes only. Please refer to technical specs for exact model and details. Available in Purple Colour. 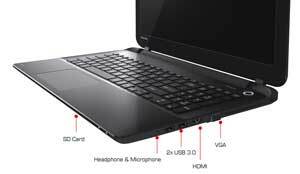 Whatever you're into, the super-slim Satellite L50 -B series laptop has everything to keep you entertained. Measuring 23 mm at its thinnest, and weighing from just 2.2 kg, you can take the L50 -B anywhere. With a wide range of multimedia options -- and a choice of Intel processors* -- you'll have all you need to connect to your world. The laptop's Skullcandy-tuned speakers and headphone jack, combined with DTS Sound audio enhancement means your audio will be rich, deep and vibrant. The L50-B's frameless tile keyboard and large click pad look great and make input easy too. So, whether you're into films, socialising online, web surfing or photography, you can stay entertained by rich sound and graphics on a 15.6-inch display -- wherever you go. 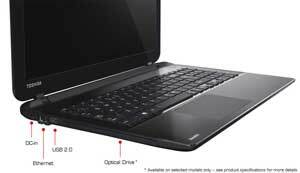 The Toshiba Satellite L50 -B has an integrated HDMI port for added convenience and enhanced usability. You can connect your laptop to an external device and stream high definition content. When using HDMI, audio and visual content are streamed through a single cable, removing the need for multiple connections. You only need one cable, making connecting your laptop easier and tidier. Thanks to HDMI technology, when connecting to a compatible display via a HDMI 1.4 cable, you'll be able to output amazing entertainment to the big screen. On selected models you'll even be able to experience entertainment when pairing this laptop with 4K display**. Wireless display technology allows you to seamlessly share content between devices, such as TVs and projectors. The Satellite L50-B also comes with one USB 2.0 port, two USB 3.0 ports, making it quick and easy to transfer large data quickly to your other devices, upload your camera photos, share movies and sync your mobile devices wirelessly. You can even recharge your phone or MP3 player without switching your laptop on, with USB Sleep-and-Charge, or connect to HD TVs and displays with HDMI.